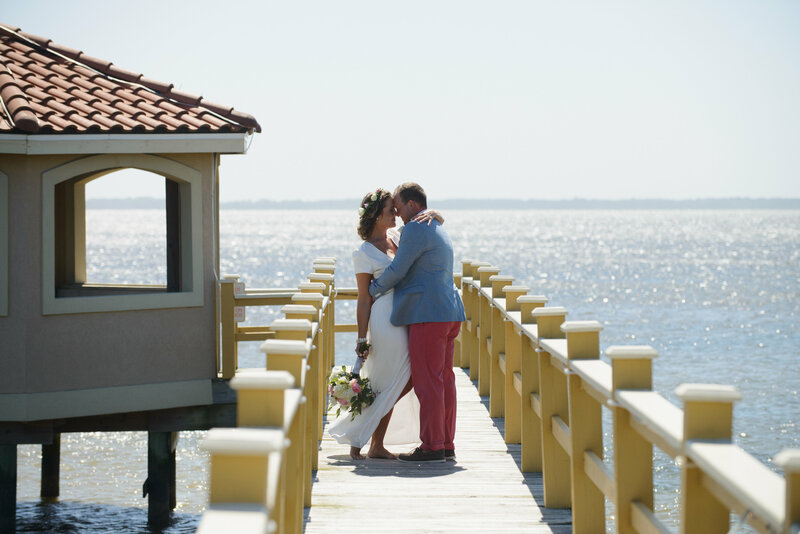 Kristi & Andy chose the Grande Ritz Palm in the Outer Banks for their summer Duck wedding last year and let me tell you – it couldn’t have been more perfect! Sometimes you meet someone and are immediately just so thankful that your path’s crossed and Kristi was one of those people for me! From the first conversation we had, through the year of planning and on the wedding day I was just so happy that we were able to work together and become friends! It’s not everyday that a bride shares your crazy obsession with gold, sequins, glam & special touches. The backyard of the Grande Ritz Palm event house is incredible on it’s own – it looks like a Mediterranean villa right on the soundfront in Duck! The talented team at Red Sky Cafe provided the delicious dinner and desserts. What happens when the bride & groom don’t like cake? Do something fun & different like Kristi and Andy did! They had Red Sky make a layered chocolate chip cookie “cake”! The ceremony site at the event house doesn’t need a lot – so the bride & groom chose to have I Do OBX Chairs create a driftwood arch, accented by a swag from the Flower Gallery at Harris Teeter and complimented with mismatched lanterns lining the aisle. Rev. Jay Bowman led the ceremony in his sentimental, yet hilarious style and Club Violin offered the live ceremony music. Post-ceremony, the guests were all greeted with a champagne cocktail and enjoyed the gorgeous weather pool-side. Now let’s talk about the decor….it was ALL DIY! Kristi (and her tribe!) had been collecting all sorts of vases, bottles and jars for months and had fun painting them all varying schemes of white & gold. On the wedding day, I took buckets and buckets of fresh flowers from the Flower Gallery at Harris Teeter and added them to the vases, then created the tablescapes! I love that every single table is different but looks so good all together. The Flower Gallery also provided all of the bouquets & bouts for the guys – the soft pinks and ivory added a little bit of softness to all the glam! Lots of other little touches completed the wedding but the final piece that pulled it all together? The floating gold swan in the pool! I had been so excited about that since Kristi first told me she had bought one and it really was the perfect, fun touch for the wedding! This wedding was a featured Real Wedding in the 2017 Outer Banks Weddings Magazine! WOO!